With the Autumn deer rut in full swing Environmental Biologist David O’Brien takes us on a journey into the hills of county Wicklow in search of wild deer, and offers advice on how to watch these shy and elusive animals [CJ]. 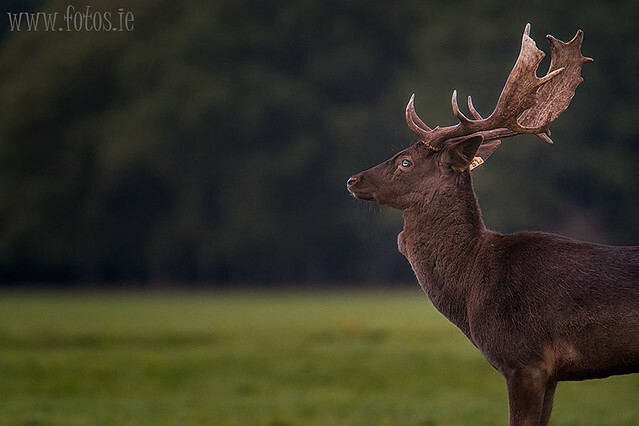 Now that we are in the middle of the rut, prime-time for watching deer, crowds of people are visiting deer-viewing hotspots like the Phoenix park in Dublin, Portumna Forest Park in Galway or the Lake Hotel in Killarney to see the sparring fallow bucks and red stags. But what about watching truly wild deer – ones that turn tail and flee at the sight or scent of a human? This is a greater challenge — at the very least it usually involves more walking — but at the same time is a correspondingly more rewarding experience. This time of year is the perfect time to try it out. Apart from the obvious difficulty of approaching an animal that is very fearful of humans, wild deer in their natural habitat are usually quite difficult to spot in the first place. Deer may stand out on the lawns of Killarney, or on the grassy acres of the Phoenix Park, but while grazing in woodland or on peatland, they blend in so well that they’re almost invisible. You can stare at a hillside for a long time and see no sign of life until a sudden movement, or a flash of white as a deer turns its back to you alerts you to their presence. To a certain extent this is a case of “getting your eye in” and learning what to look for, but it’s not always as easy as you might imagine. I remember once asking a group of hikers who’d just come down a hillside very close to a herd of sika deer if they had noticed the animals. “What deer?” came the reply. I even pointed out the herd, and let them use my binoculars for a closer look, but they still couldn’t see the animals, and eventually went off, wondering I’m sure whether I was having them on the whole time. 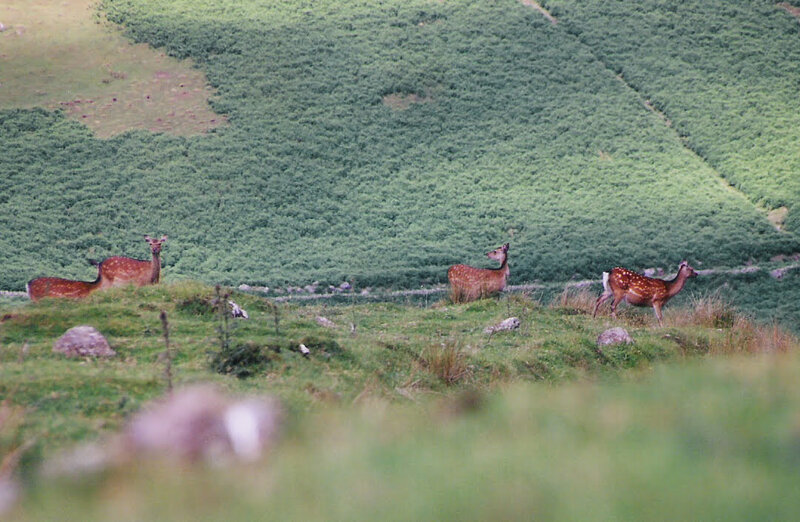 Then there was the time as a boy on Slieve Mann when my father tried, unsuccessfully, to point out some red deer hinds. At the time he didn’t specify the species, and until then I’d only seen sika deer. It was only when I asked where the deer were in relation to the red cows I could plainly see that we discovered the problem. Patience, practice and a little luck are what you need to get your eye in. Eventually you will spot a single deer on a rugged slope, and suddenly the rest will appear: rocks, hummocks, peat hags and tufts of heather transformed into living, moving animals. Wicklow is the perfect choice for many people. 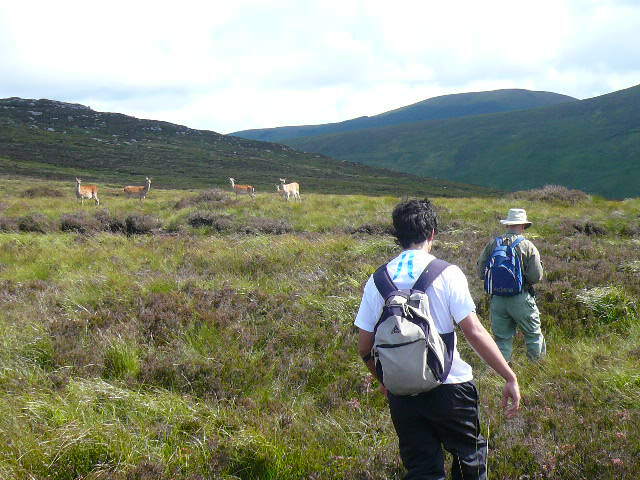 It has the highest densities of deer in the country, and is easily accessible from Dublin. 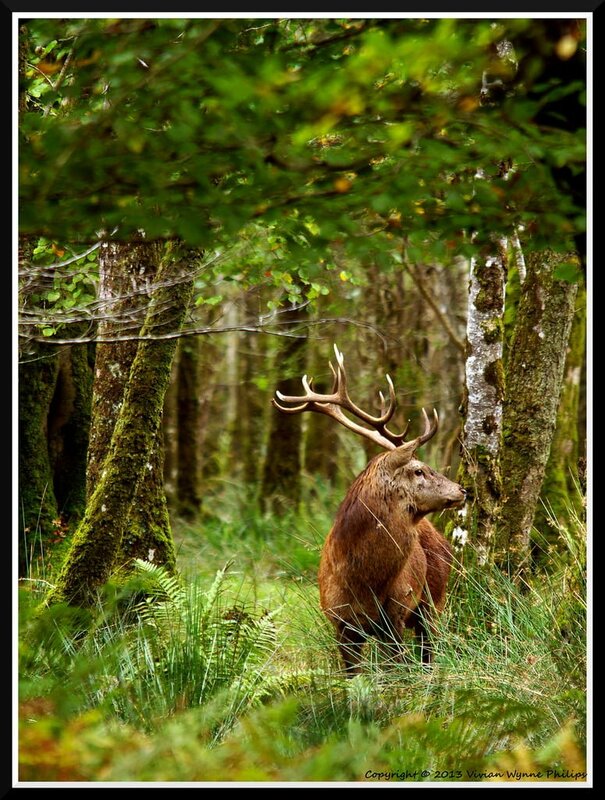 Wicklow and surrounding counties have so many deer that almost any remote location can be a good place to spot them, but two places I recommend to begin with are the Glenealo Valley above Glendalough, and an area called Balinrush overlooking Lough Dan and the River Cloghoge near Roundwood. Here, you are as guaranteed to see deer as you are standing on the gallops of the Phoenix Park. The first area can be considered a kind of stepping-stone between observing the semi-tame deer of the Phoneix Park and watching the flighty deer of the rest of Wicklow. The second will let you spot, and get close to, the latter type. Above the waterfall at the top of the Upper Lake, the large bowl-shaped Glenealo Valley forms the background for all those popular photographs of Glendalough you see. Yet, scattered right and left across that lovely scenery, if you look closely enough – especially with a pair of binoculars – are even more beautiful dots that are red and sika deer and their hybrids. If you climb up the zigzag path to the top of the waterfall and walk up the valley to the right, towards Turlough Hill, you will get quite close to several herds. The deer are not usually hunted here. The National Parks and Wildlife Service are responsible for controlling the herds, and culling is logistically more complicated in such a high-amenity area than it often is in other places. In addition, the deer are accustomed to seeing hikers and are likely to just watch you walk past, if you pretend to ignore them and resist the temptation to walk straight towards them. Deer are swift, agile animals, and the open ground gives them confidence that if you get too close for comfort, they can easily outpace you across the moor. Follow the main forestry road where it deviates from the Wicklow Way and take the next right, that later curves around to the left, to a large unforested clearing on your right hand side, with views of Luggala Mountain beyond it. There are often deer out in this clearing, grazing in plain sight, and resting in the dips and hummocks under the large clumps of heather and gorse. Walk along the trees on the right to the corner of the forest and you’ll see the ground falls down to the River Cloghoge, which drains Lough Tay, on your right, into Lough Dan, on your left. You will have clear views of the entire valley and it is spectacular – all the more so because adding to the beauty are masses of deer grazing on the mountain opposite, which a quick scan with binoculars will reveal (I usually stop counting after fifty). Down on the valley floor, especially on the lawn in front of the large stately house, there are usually a few dozen more deer too. Now, after you have rested your legs from the walk, you can cross to the other side of the clearing to see some deer much more close up (if you haven’t already come across a few hinds and calves on your way through the forest, that is). Crossing some stone walls around the outer edge of the forest, you will soon find yourself looking down directly on Lough Dan. The slopes here are steep, but the long, heather-filled clearings between the strips of spruce that angle down towards the oaks bordering the lake, are relatively protected from the wind and invite deer to graze them. The pellets and tracks will give you obvious indication of the number of deer that use these slopes, and a slow, careful, and quiet walk/stalk down along them will be rewarded by the sight of a lone stag, or a hind and calf, or a dozen, grazing on the mature heather. You’ll have to be stealthy – and use the wind to keep your scent away from their nostrils – or all you’ll see is a flash of white, accompanied by a sharp whistle of alarm from the woods. Climbing up out of the valley can be a strain on the legs and lungs. Some call it Hell, because it’s easy to go down but so hard to get out of – but a short hike up through the trees will bring you to a level forestry road. Walking left along this will bring you to a cul-de-sac, with the ruins of some houses beyond the turn-around. Skirting these ruins (have a look for the small spring used as a water source by the former inhabitants) will bring you to an almost tunnel-like path through the trees, and this will take you back to the large clearing again, from where you can retrace your steps back to your car. While you are in the forest, always keep on the look-out for deer: though the slopes down to the lake are guaranteed to have deer on them (I have never failed to see a deer — or at least startle one into whistling an alarm — on any occasion I have gone there, even in driving rain), you are likely to see some at any point along the road. If you arrive at the forestry gate and see a sign indicating that deer hunters are already in the wood, please wait for another day to go in yourself. While deer hunters are always extremely careful, it is prudent to avoid potentially dangerous situations (you would pause at a zebra crossing to make sure drivers see you, even though it’s their responsibility to stop for pedestrians). The deer in this area need to be controlled in this area, as elsewhere (something you will appreciate after your visit). However, if a hunter sees there are walkers in an area, he or she can’t hunt the area at all, just to be on the safe side. Personally I choose to let them do their job in peace – there are other beautiful places to visit nearby, and once you have your eye in, you’ll see there are deer almost everywhere too. David O'Brien is an environmental biologist, zoologist, and writer, who has studied deer biology since childhood. He got his PhD from UCD and has been a university lecturer and school teacher in the USA and Spain, where he currently lives. You can find more from David on his Google + profile and his Youtube Channel. Great article! I’m dusting off my bins for the weekend. Thanks. Very good article in first place. I visit Glenealo Valey almost each year to see Sika deers living there ( not only during rut time). I have to say that herds witch are you can meet close to tracks (white track as far as I remember) are not really scare as real wild deer should be.Probably amount of people hiking in there since so many years made them believe that nothing gonna happen. So I agree that this place is a” stepping-stone between observing the semi-tame deer of the Phoneix Park and watching the flighty deer of the rest of Wicklow”. However If go right after the bridge on the mouth of the valley and you will fallow the river probably you will find herds of deers which are very fearful of humans and not let get closer. I never been in the Balinrush but definetely try to visit this spot soon. Thanks, Karol. There are a few hybrids in Glenealo, too – I saw your photo of that stag that had red-like antler shape but a very sika-like body on wild deer of ireland facebook site, and your comment that it was a big-bodied animal. If you look in Glenealo, you can see a lot of different expression of the mixed genes, and I think the stag you photographed definitely has some red genes. Thanks David – a super read. I’m planing to go this week to the Lough Dan walk if i get some decent afternoon light. I was in the Phoenix Park Sunday (for the first time!) and the fallow rut was over. This is one i managed to isolate. Thanks Brendan. Lovely photo. A little to the left and the tag would be covered, too. if you mean Lough Dan house past the scout centre you’re on the direct opposite shore – glass that hillside opposite. To get there go back out and take a left at Oldbridge up towards the Sallygap road. Take the second left on that road, up a lane between two gardens – the one on the right is a farm and there’s a barn at the end. There’s a wooden gate (hard to leave a car here, but there is a little bit of room) and then a barrier. Walking up and taking the left hand forestry road, which curls around to the right will bring you to the old ruined houses after a kilometer. All along that road you are looking down on L. Dan. While on the clearfell you can see down, then you get to trees but the clearings I described are down past those trees. best to get to the old ruins and head downhill from there through the ridelines/paths. This is the location on google maps of that culdesac on the road.